Good Morning, Kotaku! I'll Be Your Editor This Weekend. Good morning, Kotaku! Owen isn't here right now. He can't come to the phone, and I'm certainly not taking a message for him. 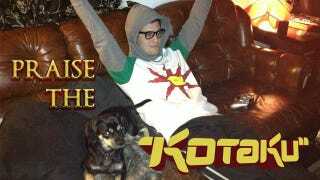 The best I can do is offer you two days of Kotaku my way. My name is Mike Rougeau. I've dreamt of covering the games industry my entire life, and now I'm doing it. I write for Complex, where Kotaku's own Tina Amini used to be my boss. My words, such as they are, have also appeared on TechRadar, G4, GamesRadar, IFC, Gameranx and others. …But I like what Kotaku's been doing too much to change it up significantly. Above you'll see a candid shot of myself and my sidekick, fellow Sunbro Ricky the Dog, praising the sun as our joint Dark Souls character did the same over a pile of steaming red souls that used to be a Darkwraith. Yeah, I like Dark Souls. I'm going to take this opportunity to talk about it. But that's not all (as much as I would love to turn this place into KotakSouls for a weekend). Today and tomorrow you can look forward to articles about the apocalypse, the NRA and the Sandy Hook shooting, and the fallacy of 48FPS. But don't worry—there will be some serious posts, as well. I'm looking forward to the next two days, and I hope you all enjoy!